entries, accessible via the Dictionary of Statistics website, which will be regularly updated to ensure the links are fully current, as well as provide helpful additional information. The entries are generously illustrated with useful figures and diagrams, and include worked examples where applicable. Appendices include a historical calendar of important statistical events, lists of statistical and mathematical notation, and statistical tables. 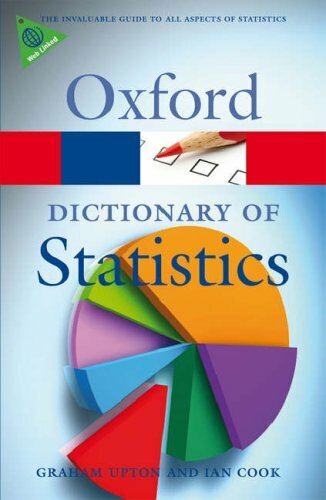 Fully updated and revised, The Dictionary of Statistics is an indispensable work of reference for students and professionals in fields related to statistics, and a clear introduction to the subject for the general reader. Relations and Equality and Diversity rep. Ian is also the cultural geography editor of Geography Compass and serves on the editorial boards of Qualitative Research and Geography. He is an Associate of the Social Sculpture Research Unit at Oxford Brookes University, an academic advisory board member of Students and Scholars Against Corporate Misbehavior, and a trustee of the Geographical Association. Ian often writes as 'Ian Cook et al' in order to acknowledge the collaborative nature of all of his work. Career Ian graduated from UCL in 1986 with a BSc in Human Sciences, from the University of Kentucky in 1992 with an MA in Human Geography, and from the University of Bristol in 1997 with a PhD in Human Geography. He began his academic career at the University of Wales, Lampeter (1993-9), then worked at the University of Birmingham (1999-2007), before moving to Exeter in August 2007.